One of the perks about having a recipe blog is that friends are eager to share their wonderful recipes with me. 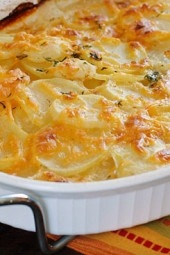 This recipe was given to me by my friend Don and it was delicious! This is a recipe I will be making again and again. Simple and delicious. You can pretty much use whatever shellfish you like, mussels, lobster, crab, even fish if you like. Serve this with some good crusty bread to sop up the juice. In a large heavy pot, saute garlic and onion in olive oil over medium flame for about 2 minutes. Add chorizo, tomatoes, wine, bay leaf, 1/4 cup parsley, salt and pepper and simmer 5 minutes. Add the clams, mix well and cover. Cook about 5 minutes or until all the clams open (discard any closed clams). 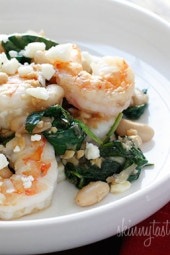 Add shrimp and scallops and cook an additional 2-3 minutes, until seafood is completely cooked. Ladle into bowls and top with a little fresh parsley. Has anyone tried this without chorizo? I don’t eat meat of any kind. 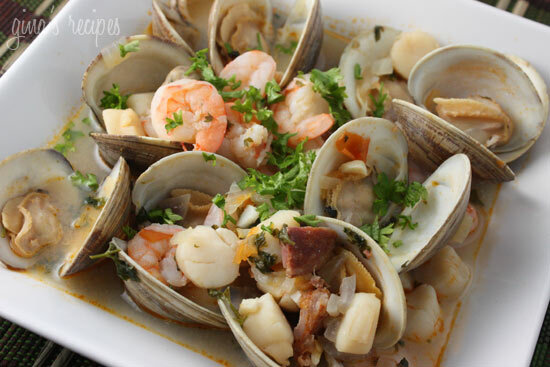 Can this dish be made with canned clams? It wont be as good, but of course you can. Delicious! I will admit that I modified extensively, borrowing ideas from other fish stew recipes…I replaced the parsley with cilantro (1/3 c. finely chopped stems with the onions and added the 1 c. of leaves at the end. ), and used chicken chorizo, and I added a bottle of clam juice. I used about 2 cups of diced tomatoes and added some finely chopped kale (I used lacinato, but I don’t think that matters…) I peeled the shrimp and seared shells in a small saucepan, and added a cup of water and cooked for 3 minutes, and strained that into the stew as well.. I used a halibut filet instead of scallops, and followed Cooks Illustrated’s cioppino technique… Build the stew base, poach the fish in the stew (& remove to keep warm in a covered dish so it doesn’t overcook). 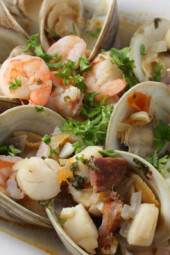 Add the shrimp to stew (now simmering on low…) Cook the clams in white wine in a separate skillet, add clams to stew as they open, and pour liquid into stew, being careful to leave any grit behind in the pan. Serve the stew into bowls and top with the poached halibut. Bom Apetite! I'm from a VERY portuguese family…..if you want to add a little kick to this…look for some portuguese hot sauce & add a little dash of that in there…that's my family's variation of this dish. Also, we serve it with a side of boiled kale..or broccoli raab & boiled potatoes (serve with a drizzle of olive oil, red wine vinegar & sea salt over the veggies)..& of course, portuguese rolls. I made this tonight and it was wonderful! Gina, you are batting 1000! Haven't found a bad recipe yet…they have all been keepers! I am so glad I found you! I just input this to a recipe calculator to come up with the nutritional info. and then entered it into WW. It came up as 10 Pts+. Could that be right? It seems to be too big a jump from your calculation under the old plan. Thanks for checking. Your recipes are excellent. Glad you liked it! I haven't tried turkey chorico, I'll look for it! I made this tonight for my family and mom and we are Portuguese. I substituted turkey chorico which was good and I served it over some left over mashed potatoes which was more hearty and of of course a few more points but very tasty. I would also try it served over rice too! Made this tonight, very tasty! I might recommend rendering the chorizo first then removing the crispy bits to add back after the seafood is done. Also, there is no mention of what becomes of the water… I assumed it is used to steam open the clams. Yum. Yum, I’m sure it’s perfect with mussels! Will have to try that next! Thanks for this recipe! I made it tonight, only with mussels instead of clams, and the man in my life fell in love! 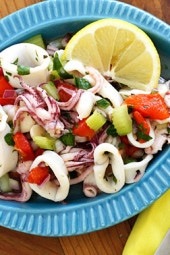 The Portuguese have a way with seafood…they actually prefer it to meat! With dishes like these – I would too! That looks fantastic, Gina! would be great at a summer barbecue! Wow, must make this! Looks totally delish! Could I have this for breakfast!?? Looks amazing! Are you kidding me?! This looks and sounds amazing!! Yum yum. This looks beautiful! I love cooking with shellfish, I don’t do it nearly often enough.